Giant spiders are invading Britain's homes - if media reports this year are anything to go by. But are they dangerous? Museum expert Stuart Hine explains why we are seeing more spiders this autumn, and what you should do if you spot one. False widow spider bites have been a hot topic in recent months, along with reports of a bumper crop of house and garden spiders, and news that city spiders are getting fatter. The warm weather this year has contributed to more spider sightings, but this doesn't necessarily mean more spiders, says Hine, who deals with the Museum's spider identification requests. Spider sightings always peak in the autumn when the males of many species reach adulthood and wander about looking for females, he says. With this year's warmer weather, we are keeping our doors and windows open longer into the spider season, and letting more of the wandering males in. 'They aren't bigger, and there aren't really more of them. What we can say is that because of the weather and our windows and doors remaining open, there are more observations of some of the larger species that enter our homes,' said Hine. The warm and dry autumn provides a longer season for many of the male spiders, who will roam around for longer rather than finding a dry garage or attic to hide in when it's wet. 'The kindest thing anyone can do is let them outside. They are only looking for one thing, and that's the lady spider,' said Hine. Araneus diadematus, the European garden spider. The bodies of females can be up to 20mm long. Their colour ranges from dark grey to light yellow and orange, but all have large white dots forming a cross on their back. Hine gets a lot of reports of house spiders, the generic name given to a group of large, long-legged indigenous spiders in the genus Tegenaria. Males can have a leg span up to 75 millimetres, and they are usually brown and hairy with dull stripes on the body. House spiders are not as common as they used to be - homes are now better sealed and central heating and more disturbance makes them dry and unwelcoming to Tegenaria. 'There is a generation now that have never seen these things before, whereas going back 20-30 years it was just something you accepted,' said Hine. Tegenaria can bite if picked up, but the effect of their venom is small, so getting bitten is unlikely to cause any serious complications. One spider that has benefited from the good summer weather is the European garden spider, Araneus diadematus. People often spot the females sitting in the middle of their large webs in gardens or across doors and windows. 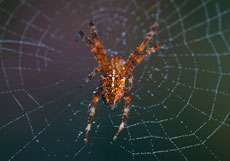 However, the turn to colder and wetter weather will stop insects flying and stop the garden spiders feeding. Steatoda nobilis, the noble false widow spider. Males can reach up to 11mm in size. They have reddish-orange legs and brown bulbous body with cream coloured markings. 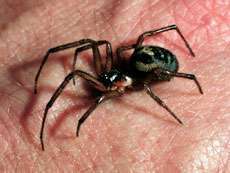 Reports of false widow spiders are on the rise again this year. The term false widow actually describes several species of spider, but the one that gains the most attention is Steatoda nobilis, or the noble false widow spider. S. nobilis has been in Britain for over a century, probably after being introduced in ship cargo from the Canary Islands or Madeira. The species has been expanding its range north in Britain since first establishing itself on the south coast. Hine says that part of the increase in sightings is due to greater numbers and wider distribution, but also because people are more aware of them. 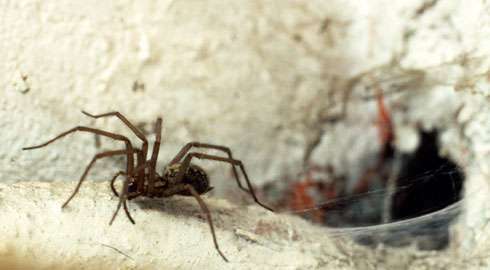 False widows attract attention as being one of the few British spiders capable of delivering a venomous bite. However, they will only do so if they are trapped or squashed, often in clothing. 'They're not entirely harmless, these things can bite under certain circumstances. But wasps and bees sting too and we don't have that same level of fear of them. This spider has an unwarranted reputation of being so much more sinister,' said Hine. Hine has been bitten three times by false widows, and each time has experienced 'a slight sting and a little numbness in the area.' Reports of extreme reactions are more likely the result of related infections from exposure of the wound. The best advice if you are bitten, says Hine, is to keep the area clean and use an antihistamine cream to stop the area feeling itchy and reduce the risk of infection by scratching. If those spiders worry you don't move to Australia, these are two of our harmless (to humans) spiders.